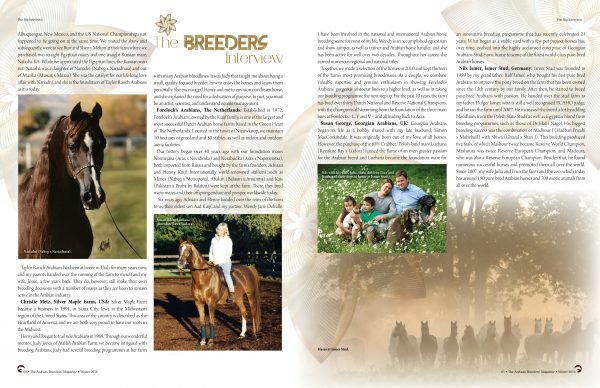 The Breeders Interview – Isaac Taylor, Taylor Ranch Arabians. 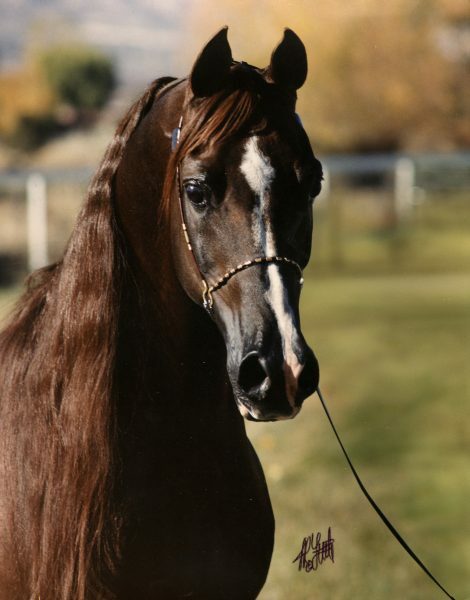 Taylor Ranch has been breeding Arabian horses for over 30 years. 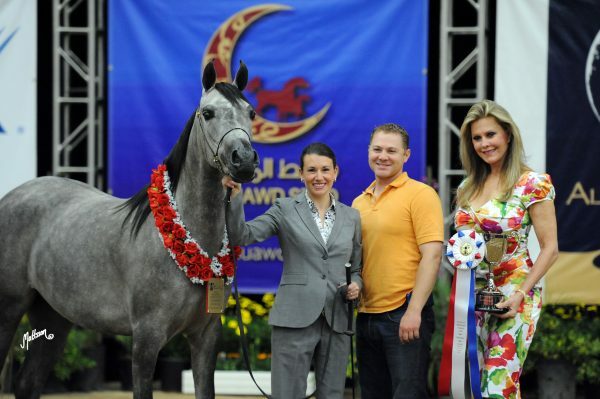 Founded by my parents, Rick and Paula Taylor, Taylor Ranch Arabians has become synonymous with Russian breeding. The first horse my dad purchased was Sardare (Lufar x El Celeste) and the rest was history. Our passion for the breed, however, began back in the 1960s as my uncle had a small Arabian horse farm that we used to visit. My dad always dreamed that one day, he would have his own Arabian horse. 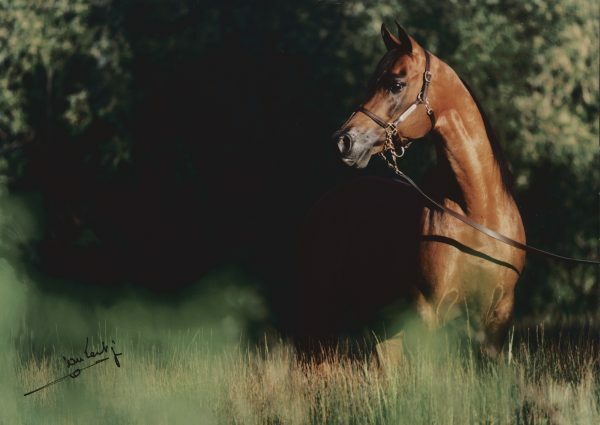 Sardare arrived and by the time I was a child in the early 1980s, Arabian horses were very firmly a way of life for us and there was always one or two on the farm. Muscat (Salon x Malpia). Credit JR Little. Our lives changed when, in 1990, we went to visit family in Albuquerque, New Mexico, and the US National Championships just happened to be going on at the same time. We visited the show and subsequently, went to see Burt and Sherry Melton at their farm where we purchased two straight Egyptian mares and one straight Russian mare, Natasha RA. While we appreciated the Egyptian lines, the Russian won out. Natasha was a daughter of Nariadni (Nabeg x Nariadnaia) and out of Muzika (Muscat x Muzza). She was the catalyst for our life-long love affair with Nariadni, and she is the foundation of Taylor Ranch Arabians as it is today. Taylor Ranch Arabians has been at home in Utah for many years now, and my parents handed over the running of the farm to myself and my wife, Jessie, a few years back. They do, however, still make their own breeding decisions with a number of mares as they are keen to remain active in the Arabian industry. Aladdinn (Nureddin x Lalage). Credit Van Lent. 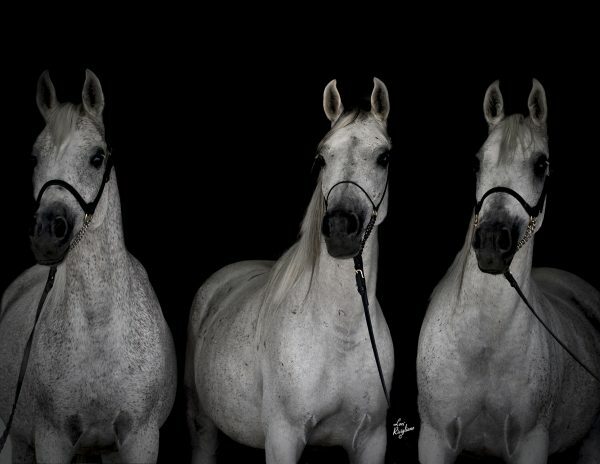 We were very blessed to own the great Russian stallions Muscat (Salon x Malpia), Aladdinn (Nureddin x Lalage), and Nariadni. Naturally, our breeding programme has been based around them, although we have just started to outcross in the past few breeding seasons with great success. Our two-year-old colt IJ Bellatore is one such example. He is out of TR Scarlet Ginger (Om El Bandeiras x HK Pamella), one of our most precious mares and she incorporates the bloodlines of Nariadni and Muscat. His sire, however, is JJ Bellagio (Magnum Psyche x Joyeuse NY), who has two crosses to Aladdinn through his damline. As a breeder, you constantly want to evolve and we saw that Bellagio had much of what our mares needed. Our faith in the outcross was proven when Bellatore was born and he went Champion International Yearling Colt Jan 1-April 15 and was the highest scoring junior stallion of the show at Scottsdale last year. He followed this up with Las Vegas World Cup Reserve Champion Yearling Colt and Silver Champion Yearling Colt of the US Open in Central Park NY. We have repeated this breeding twice more, resulting in the yearling filly IJ Belleza and a full brother born this year. As I mentioned, my parents are still breeding and while this is on a much smaller scale, my dad wanted to have one more chance at breeding a champion. So 2014 saw the arrival of TR Poseidon and he fulfilled our dreams by going Scottsdale Signature Champion Yearling Colt in 2015, as well as unanimous Region 7 Champion Yearling Colt. TR Poseidon is sired by Pogrom (QR Marc x Petla) and is out of TR Aladdinn Angel (Aladdinn x NV Shahrotica). 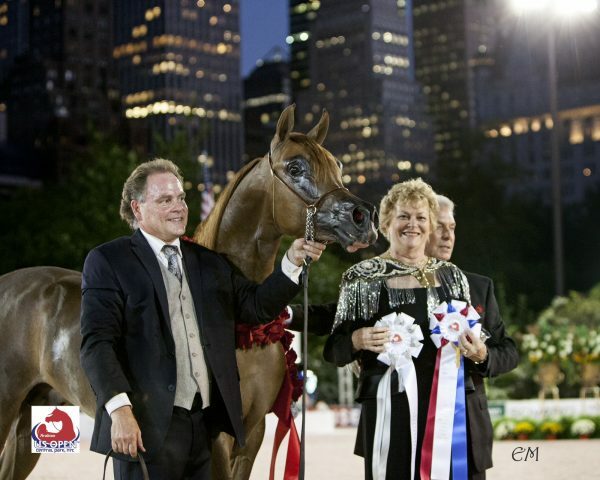 IJ Bellatore (JJ Bellagio x TR Scarlet Ginger), Silver Junior Male Champion at the US Open. Credit Emma Maxwell. Isaac: We have always had the goal to breeding beautiful, athletic horses and we found that the Russian Arabians best encompassed that. Our goals have not changed although we have added different bloodlines with varying success. When we have found an outcross that works with our horses and brings specific attributes we are searching for, we adopt it into our programme. Above all, we have always bred for substance and function and we love to blend the old with the new. We want to ensure the genotype that we have always admired so much – and that has done so very well for us in the past – is acknowledged in the future. I guess that our ultimate aim is for Taylor Ranch Arabians to be renowned for being breeders of quality horses on the world stage once more. We were, before fashions changed, and Bellatore and Poseidon both prove that we can get back there again. IJ Bellatore (JJ Bellagio x TR Scarlet Ginger), Silver Junior Male Champion at the US Open. Credit Taylor Ranch Archives. Isaac: Having some amazing mentors in the early years of breeding was key to our success. When my parents purchased Natasha RA back in 1990, they researched all that they could about her lines as they both recognised and appreciated her quality. This research led us to Howard ‘Howie’ Kale Jr, a man recognised the world over as one of the premier Russian breeders in the world. Howie was the first person to bring the Russian Arabian to the United States and his knowledge on these bloodlines is second to none. One recollection that I remember vividly was when I was 10 years old. 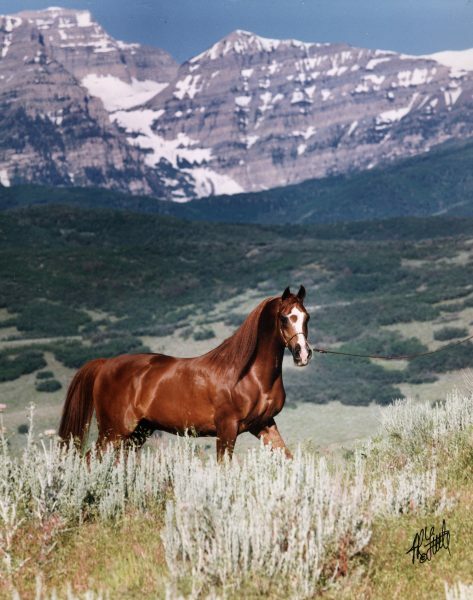 Howie was getting ready to bring Nariadni back to Arizona from Kentucky and somehow, my dad managed to persuade Howie to let this magnificent stallion come to our home in Utah! This was the catalyst that we needed to push us to the next level and before we knew it, we had 30 mares and then 60! The opportunities that came about through having Nariadni at the farm were incredible, and hence we were able to purchase some of the finest Arabian mares in the world. It really was an amazing time. We were extremely lucky to have been mentored by the Kales, among others, who graciously shared their knowledge and successes and failures. Jessie and Isaac Taylor with TR Amadora (HK Marcello x TR Scarlet Satin). Credit Anette Mattsson. Isaac: We feel that success for any breeding programme is achieving a level of consistency that you are hoping to produce. We are very proud of the ‘Taylor look’, and we love that people can recognise our bloodlines. Isaac: Breeding for the market or following fashion in the show-ring with a willingness to sacrifice important breed traits has damaged our breed without question. Certainly, the show-ring has contributed to this. Many people make their breeding decisions based on who has won certain shows, without any regard for how a specific cross may work. Three Sanadik El Shaklan daughters (l-r) TR Heavens Breath (Sanadik El Shaklan x TR Breathless), TR Silk Whisper (Sanadik El Shaklan x TR Silk Bouquet), TR Lady Sanadik (Sanadik El Shaklan x HK Raffina). Credit Lori Gicigliano. Isaac: Unfortunately, there are many people who breed horses but few true breeders left. I think this all links in with my previous answer. Breeders think in generations and very few people still do that. And unfortunately, this trend for breeding for market or fashion appears to be continuing. I think that education is the biggest issue that we are missing in our industry right now. Conformation, genetics, and pedigrees should be studied and studied before any decision to breed is made. 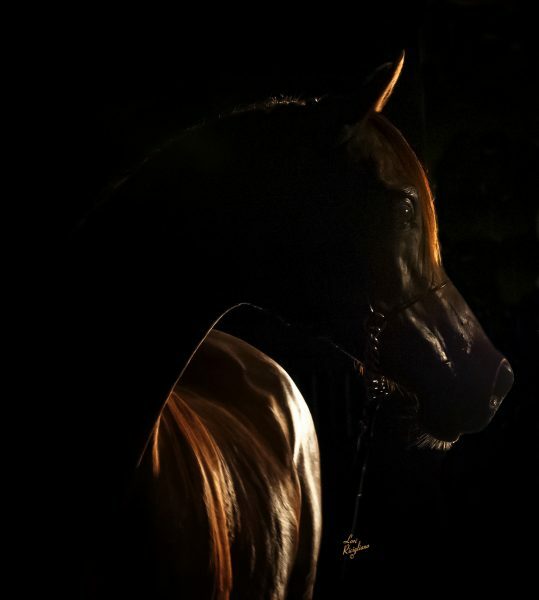 Being willing to acknowledge the faults in each horse, even the champions, and taking those faults into account before breeding, would go a very long way in producing better horses in each generation, and that should be the goal of each breeder. TR Poseidon (Pogrom x TR Aladdinn Angel). Credit Scott Trees. Isaac: Yes, they very much do. With the right education, we can ensure that future generations breed horses for the right reasons and not for the wrong ones. Articles such as this, where lifelong breeders can share their knowledge, is a small step in the right direction. Isaac: I feel our biggest success has been producing beautiful, athletic horses that have a certain look. Our two champion colts, IJ Bellatore and TR Poseidon, will be expecting their first foals in 2017. They are the best colts that we have produced in probably a decade, and we have placed great hope in them. The greatest satisfaction we get is having homebred horses that represent generations of our breeding that are able to cross the gap of being modern without giving up the traits we have held dear for many generations of our programme. TR Scarlet Ginger (Om El Bandeiras x HK Pamella). Credit Lori Gicigliano. Isaac: As I mentioned, we have our first foals due from Bellatore and Poseidon, and we are excited for what their future holds as sires. 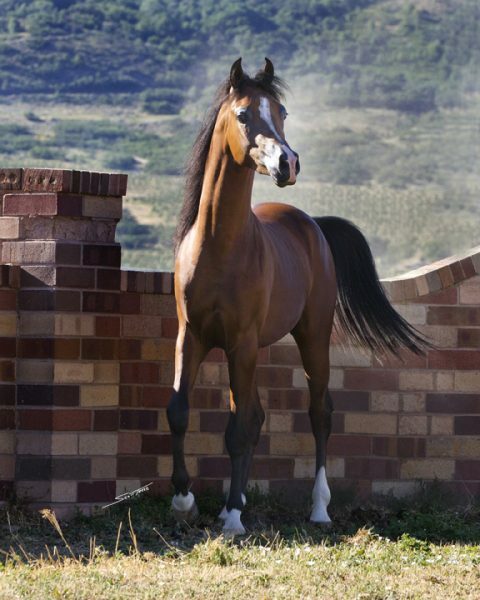 It is one thing to breed a great show horse, but to breed a great stallion is always the ultimate goal. This year, Jessie and I started our own family when we had our daughter, Hazel. So right now, we are looking forward to a family Thanksgiving with my parents and our daughter. Next year will be very exciting for us, and at the moment, we just want to be grateful for all that we have and all that we have achieved.